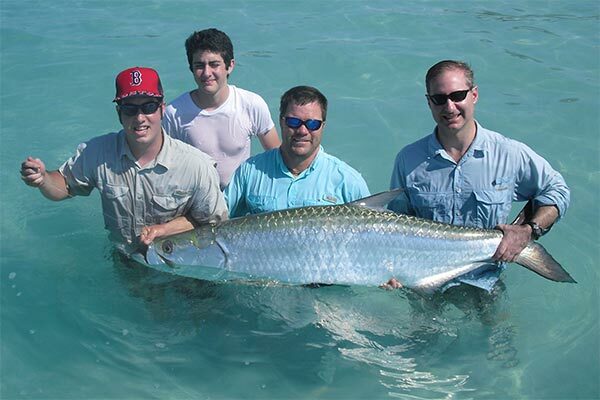 Tarpon fishing is guaranteed excitement for seasoned anglers and to those who have never even been fishing before. Whether you’re a tarpon fishing guide, a regular who books tarpon charters, the angler on the beach, or in a kayak who paddles his heart out for just one cast, or beginner fisherman; there is nothing like the thrill of a tarpon exploding out of the water after the hook set. 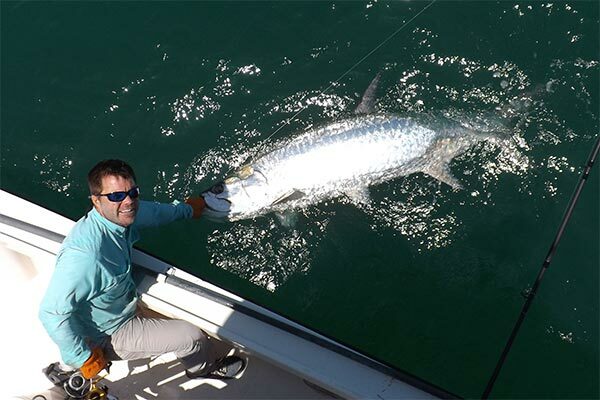 Tarpon fishing has all the thrill of hunting and stalking, along with the skill of fishing that makes the anticipation factor leave your body pumping with adrenaline. 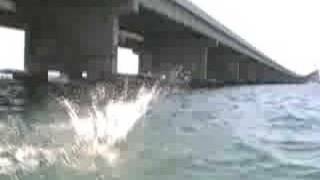 Tampa bay tarpon fishing is one of the finest fisheries in the world. The tarpon in the bay area are second to none for size and sheer numbers. Most of the fish run from 50 to 200 pounds plus. Average tarpon are 70 to 140 pounds. Trophy tarpon in these parts are 150 to 200 plus pounds. There have been tarpon landed in the bay that hit the scales just under 250 pounds. Surely there is a larger one that would break the world record swimming out there. A good day on my tarpon charters we may hook up to 20 plus grown mature tarpon. An average day during peak tarpon season, May through July, we average 8 to 12. Even on the slow days we usually manage 3 or 4 tarpon hooked ups. Now tarpon are very hard fighters, even on 50 pound test tackle a fight on a large fish can go two hours. With high flying hard head shaking jumps and long power runs leave a lot of opportunity for them to get off. On a good day of tarpon fishing we may land half a dozen tarpon, on an average day expect 2 to 4 on my tarpon fishing charters. Even on a slow day we’ll probably land a least one. When it comes to tarpon it’s really not all about the landing, it’s more about the battles, and even the ones that get away are exciting. It’s those first 15 minutes when the tarpon make their most explosive jumps. exploding out of the water after the hook set. Imagine it’s May, the water is flat as glass and the sky is purple in the east as the sun rises. You’re sitting in the bow of a 24 foot custom tarpon tower boat designed and souped-up for nothing but slaying tarpon. 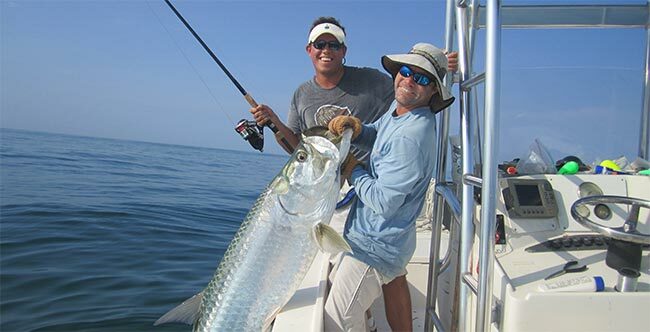 At the helm is one of the gulf coasts most experienced tarpon fishing guides. As far as your guide is concerned he never goes home empty handed and tarpon fishing is his favorite thing to do, you’re feeling confident. The cool morning air brushes across your face as you watch the sun rise racing out across the bay on our way to catch tarpon bait. Daily fresh threadfin shad and green backs are a must for a successful day and your charter captain knows right where to get them. A half hour later the captain asks, “are you guys ready to rock” as he empties his final cast net full of perfect size tarpon bait into his live well. That’s code for we’re loaded with bait and we are going have one exciting day of tarpon fishing. Your captain climbs to the upper helm and jumps the boat up on plane, heading south along the clear white sand bottom beaches of Anna Maria Island. A tarpon Mecca known as one of the best places to site fish tarpon in the world. 15 minutes later the captain drops off plane and yells, “grab your rods”. You look around wondering what he has seen, the 6 horse power trolling motors are running full bore. Your captain is focused, it’s obvious he sees something and he knows where he is going. Five minutes later the rods are out the back of the boat, 3 corks floating 10 feet apart. Suddenly 20 giant tarpon all come to the surface at the same time just 20 yard beyond the corks and your captain has positioned you perfectly. He yells down that there are at least a hundred fish in the school, bunched up perfectly and any minute now guys. Now your heart starts beating faster, you grip the rod tighter with anticipation. The fish rise again now five yards away. The captain yells again, “Point your rods at the corks and get ready to strike”. This is the moment of truth. Again the captain starts to yell out, almost as if he is counting down, “Get ready, Get ready”! Suddenly the yellow cork fires under, it’s yours, instantly your brain registers and you set the hook as hard as you can. The captain yells for a second hook set and you do so. The largest fish you have ever seen leaps 15 yards off the back of the boat, 8 ft into the air and it’s hooked to your line. The Giant tarpon cartwheels in the air end over end, two times in a row and then line starts peeling off the reel as your drag begins to sing. “Set the hook,” you hear the captain yell again. You turn to look over your shoulder just in time to see you best friends first tarpon leap out of the water. For a minute there you where in your own little world, it just registers that while you where battling your fish your friends were getting into position for theirs. The boat now has two giant tarpon hooked up. You look over at you friend, his face is beaming with excitement, as is yours. You realize at that moment that you’re living out a dream. “Set the hook,” you hear the captain yell again. You turn to look over your shoulder just in time to see you best friends first tarpon leap out of the water.